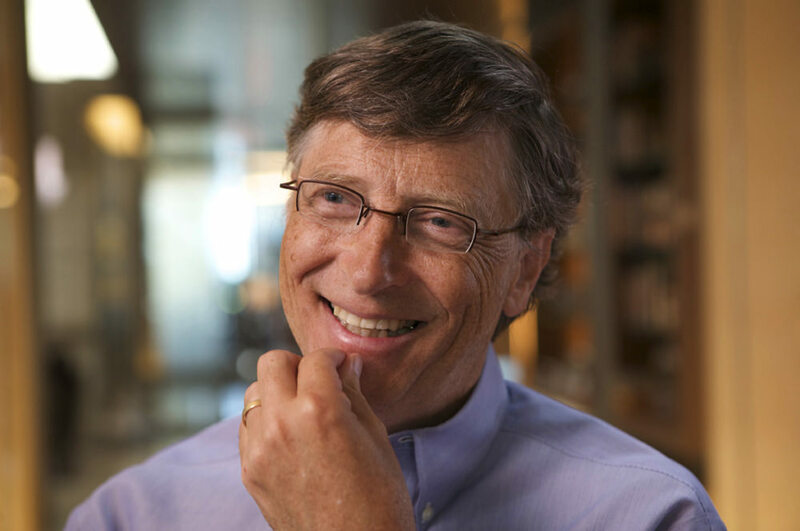 Several hundred Harvard students got a thrill on Thursday when Microsoft co-founder Bill Gates ’77, LL.D. ’07, came to campus. After touring the Harvard Paulson School of Engineering and Applied Sciences (SEAS), where he learned about mechanical bees  and soft robots  that can gently grasp delicate objects, Gates engaged in a wide-ranging Q & A at the Science Center with the students, who came from throughout the University. Asked about parenting, he said his wife does “80 percent of it.” Regrets from his undergraduate years? “Not socializing enough.” Gates was introduced by University provost Alan Garber, a College classmate who praised him in particular for the rigorous, data-driven approach that he and his wife have taken to allocating and measuring the effects of their philanthropy through the Bill & Melinda Gates Foundation. What emerged from the session was Gates’s sense of the sharp contrast between the success of their efforts to reduce inequities and improve outcomes in global health, and the challenges of achieving similar returns in the realm of education, specifically in the United States. In response to a student question about the education system in the United States, Gates noted that 20 percent of the total funding his foundation provides globally goes toward education in the U.S. That, he explained, is because the lack of research and development funds to spark innovations that might improve educational outcomes is a classic market failure. In all, the Gates Foundation spends $800 million a year on education domestically—the aim has been to push the United States up to become one of the top three countries with the best educational systems. But even after 20 years of working in that area, he said, the results have been almost unnoticeable. That’s been a disappointment in a country dedicated to the proposition of equity of opportunity. In contrast, “the statistic” he is “most proud of” (a response to another student question) is the reduction in the global death rate of children under five. By 2030, he said, that rate is projected to halve again, when only 2 percent of children worldwide will die before the age of five, nearly matching the 1 percent level found in the world’s richest countries. The visit ended with a final question from a freshman studying cell biology, who asked Gates what field he would go into today, if he were once again an undergraduate about to embark on his career. Gates, who once thought he would become a professor of mathematics, replied that he would again go into software—but not the kind that was cutting edge when he was in college. Back then, the frontier was defined by the technological shift Gates foresaw: from mainframe to personal computers. Today, the future is not software to run the now ubiquitous PCs. Instead, Gates explained, the future is artificial intelligence: designing the software to run autonomous thinking machines. Perhaps even for robots, like those he’d seen earlier that day….